When you learn how to play the piano, first you have to learn notes, scales, and chords, and only then will you be able to play a piece of music. The same principle applies to speech and to reading, where instead of scales you have to learn the alphabet and the rules of grammar. But how do separate small elements come together to become a unique and meaningful sequence. It has been shown that a specific area of the brain, the basal ganglia, is implicated in a mechanism called chunking, which allows the brain to efficiently organize memories and actions. Until now little was known about how this mechanism is implemented in the brain. In an article published online on January 26, 2014 in Nature Neuroscience, neuroscientist Dr. Rui Costa, and his postdoctoral fellow, Dr. Fatuel Tecuapetla, both working at the Champalimaud Neuroscience Programme (CNP) in Lisbon, Portugal, and Dr. Xin Jin, an investigator at the Salk Institute, in San Diego, California, reveal that neurons in the basal ganglia can signal the concatenation of individual elements into a behavioral sequence. "We trained mice to perform gradually faster sequences of lever presses, similar to a person who is learning to play a piano piece at an increasingly fast pace," explains Dr. Costa. "By recording the neural activity in the basal ganglia during this task, we found neurons that seem to treat a whole sequence of actions as a single behavior." The basal ganglia encompass two major pathways, the direct and the indirect pathways. The authors found that although activity in these pathways was similar during the initiation of movement, it was rather different during the execution of a behavioral sequence. "The basal ganglia and these pathways are absolutely crucial for the execution of actions. A simple adjustment to a powerful gene-editing tool may be able to improve its specificity. In a report published online on January 26, 2014 in Nature Biotechnology, Massachusetts General Hospital (MGH) investigators describe how adjusting the length of the the guide RNA (gRNA) component of the synthetic enzymes called CRISPR-Cas RNA-guided nucleases (RGNs) can substantially reduce the occurrence of DNA mutations at sites other than the intended target, a limitation the team had previously described just last year. "Simply by shortening the length of the gRNA targeting region, we saw reductions in the frequencies of unwanted mutations at all of the previously known off-target sites we examined," says J. Keith Joung, MD, PhD, associate chief for Research in the MGH Department of Pathology and senior author of the report. "Some sites showed decreases in mutation frequency of 5,000-fold or more, compared with full-length gRNAs, and importantly, these truncated gRNAs - which we call tru-gRNAs - are just as efficient as full-length gRNAs at reaching their intended target DNA segments." CRISPR-Cas RGNs combine a gene-cutting enzyme called Cas9 with a short RNA segment and are used to induce breaks in a complementary DNA segment in order to introduce genetic changes. Last year, r. Joung's team reported finding that, in human cells, CRISPR-Cas RGNs could also cause mutations in DNA sequences with differences of up to five nucleotides from the target, which could seriously limit the proteins' clinical usefulness. The team followed up those findings by investigating a hypothesis that could seem counterintuitive, that shortening the gRNA segment might reduce off-target mutations. Researchers from Melbourne's Walter and Eliza Hall Institute in Australia have discovered that breast stem cells and their 'daughters' have a much longer lifespan than previously thought, and are active in puberty and throughout life. The longevity of breast stem cells and their daughters means that they could harbor genetic defects or damage that can progress to cancer decades later, potentially shifting back the timeline of breast cancer development. The finding is also integral to identifying the 'cells of origin' of breast cancer and the ongoing quest to develop new treatments and diagnostics for breast cancer. Breast stem cells were isolated in 2006 by Professors Jane Visvader and Geoff Lindeman and their colleagues at the Walter and Eliza Hall Institute. Now, in a project led by Dr. Anne Rios and Dr. Nai Yang Fu that tracked normal breast stem cells and their development, the team has discovered that breast stem cells actively maintain breast tissue for most of the life of the individual and contribute to all major stages of breast development. The research was published online on January 26, 2014 in Nature. Professor Lindeman, who is also an oncologist at The Royal Melbourne Hospital, said discovering the long lifespan and programming of breast stem cells would have implications for identifying the cells of origin of breast cancers. Professor Visvader said understanding the hierarchy and development of breast cells was critical to identifying the cells that give rise to breast cancer, and to understanding how and why these cells become cancerous. "Without knowing the precise cell types in which breast cancer originates, we will continue to struggle in our efforts to develop new diagnostics and treatments for breast cancer, or developing preventive strategies," Professor Visvader said. A research unit in an international cooperation project led by the University of Konstanz (Germany)-based neurobiologist and zoologist Professor Dr. Giovanni Galizia, has been the first to demonstrate that fruit flies are able to distinguish cancer cells from healthy cells via their olfactory sense. In an article, published on January 6, 2014 in an open-access article in the international scientific journal "Scientific Reports" by the Nature Publishing Group, researchers of the University of Konstanz and the University La Sapienza in Rome, Italy, describe how characteristic patterns in the olfactory receptors of transgenic Drosophilae can be recorded when activated by scent. Not only could a clear distinction be made between healthy cells and cancer cells; moreover, groupings could be identified among the different cancer cells. "What really is new and spectacular about this result is the combination of objective, specific, and quantifiable laboratory results and the extremely high sensitivity of a living being that cannot be matched by electronic noses or gas chromatography," explains Dr. Galizia. Natural olfactory systems are better suited to detecting the very small differences in scent between healthy cells and cancer cells. This fact has already been shown in experiments with dogs; however, these results are not objectifiable and are thus not applicable for a systematic medical diagnosis. The researchers from Konstanz and Rome used the fact that single odorant molecules dock to the receptor neurons of the flies' antenna and thus activate the neurons. In an imaging technique developed by the researchers, the different odorant molecules of the respective scent samples create different patterns of activated neurons, which fluoresce under the microscope when active, thanks to a genetic modification. A cancer normally lives and dies with a person, however this is not the case with a particular sexually transmitted cancer in dogs. In a study published in the January 24, 2014 issue of Science, a team of researchers led by Professor Sir Mike Stratton (image), Director of the Sanger Institute, has described the genome and evolution of this cancer that has continued living within the dog population for the past 11,000 years. A commentary on these results, written by canine genetics experts Dr. Heidi Parker and Dr. Elaine Ostrander, is also published in the same issue of Science. Scientists have sequenced the genome of the world’s oldest continuously surviving cancer, a transmissible genital cancer that affects dogs. This cancer, which causes grotesque genital tumors in dogs around the world, first arose in a single dog that lived about 11,000 years ago. The cancer survived after the death of this dog by the transfer of its cancer cells to other dogs during mating. The genome of this 11,000-year-old cancer carries about two million mutations – many more mutations than are found in most human cancers, the majority of which have between 1,000 and 5,000 mutations. The team used one type of mutation, known to accumulate steadily over time as a “molecular clock,” to estimate that the cancer first arose 11,000 years ago. “The genome of this remarkable long-lived cancer has demonstrated that, given the right conditions, cancers can continue to survive for more than 10,000 years despite the accumulation of millions of mutations,” says Dr. Elizabeth Murchison, first author of the Science article from the Wellcome Trust Sanger Institute and the University of Cambridge. A small, secretive creature with unlikely qualifications for defying gravity may hold the answer to an entirely new way of getting off the ground. Salamanders—or at least several species of the Plethodontidae family—can jump, and humans would like to know a lot more about it. “This particular jump is unique in the world,” said graduate researcher Anthony Hessel, as quoted in a January 21, 2014 press release from Northern Arizona University (NAU). “That’s why I think a lot of people are finding this very interesting.” The NAU student calls the move a “hip-twist jump” that powers a “flat catapult,” describing the biomechanics in language the public can access. But the work has caught the attention of a highly technical crowd. Hessel, who studies muscle physiology and biomechanics, recalled the moment he fully grasped the reach of his findings. An email from a premier journal reached him over the holiday break with the subject line “Science is interested in your work.” The contact arose from his presentation at the Society for Integrative and Comparative Biology symposium. There will likely be more who are interested. “It’s a new way to get vertical lift for animals,” Hessel said. “Something that is flat on the ground, that is not pushing directly down on the ground, can still get up in the air. I’d say that hundreds of engineers will now toy with the idea and figure out what cool things can be built from it.” Hessel used high-speed film, a home-built cantilever beam apparatus, some well-established engineering equations, and biomechanical analysis to produce the details of how a slippery little amphibian with short legs can propel itself six to 10 times its body length into the air. 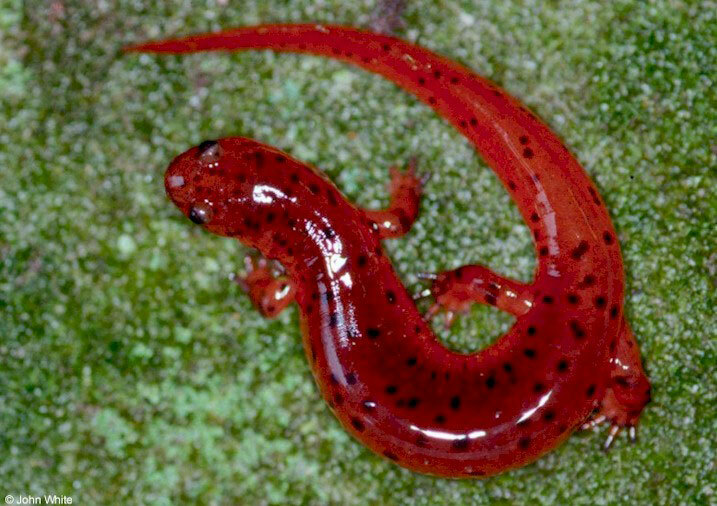 The key is that the salamander’s legs don’t provide the push that most creatures would require.